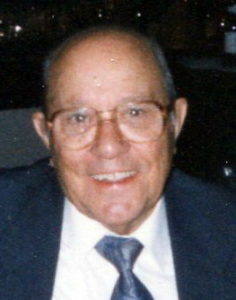 Dominick J. DiNoia, 98, of Keansburg, N.J., formerly of Westerleigh, passed away on Sept. 28, 2016, at the Care One At Kings James facility in Atlantic Highlands, N.J., where he resided for the past two months. He was born in Port Richmond and moved to Westerleigh in 1972. He had resided at the Bayside Assisted Living in Keansburg since 2012. He served during World War II as a corporal in the U.S. Army and was wounded in the European Theatre. He received the Purple Heart and the American defense service medal for his bravery. Before he moved to Keansburg, he was a parishioner at Holy Family Church and was also a member of the Mariners Harbor Senior Center, Assumption Council Knights of Columbus, and H&C Cichon Post in Elm Park. He and his wife, the late Louise (nee Palladino) loved to travel and take trips to Atlantic City. Dominick is survived by his son, John and daughter-in-law, Theresa DiNoia; his sister, Lena Susinno, and his loving grandchildren, Lauren Nilsen, Christine and Stephanie DiNoia. He was predeceased by his wife, Louise; his daughter, Theresa M. Patey, and his brothers, Louis, Vincent, and his sister, Marie. Funeral from Cherubini McInerney Funeral Home, formerly Meislohn-Silvie, 1289 Forest Ave., Staten Island, N.Y. on Saturday at 8:45 a.m. with a Funeral Mass at Holy Family R.C. Church at 9:15 a.m. Friends will be received on Friday from 2 to 4 and 7 to 9 p.m. Burial will be at St. Peter’s Cemetery.